Most people view a black belt as a symbol of proficiency in martial arts. Not as many people know, however, that many martial arts programs grant advanced black belt degrees that represent training and mastery beyond the first black belt. Second-degree black belt students learn higher-level skills and display a greater degree of proficiency in this combat sport. To be considered for a second-degree black belt, a martial artist must earn a first-degree black belt, called shodan, in Japanese karate. Different organizations and styles have different requirements for this rank, but most require 4 to 6 years of training. The curriculum for this rank includes basic strikes, kata and historical and/or ethical training. Many styles of karate include self-defense techniques, which include combinations of basic strikes designed to respond to a specific combat situation. In many martial arts, shodan-level students receive weapons training -- most commonly the staff, katana, nunchaku or sai. After attaining black-belt rank, a karate student studies two distinct categories of training. He spends much of his time reviewing and refining the material learned up to black belt and learns additional material to qualify for a second-degree black belt. In most organizations, the requirements necessary to earn a second-degree belt are conceptually similar to the first-degree belt requirements, but second-degree students learn advanced strikes, kata and self-defense concepts. Nearly all second-degree black belt candidates receive training in one or more weapons. Most martial arts organizations require students to study for a defined period of time, regardless of how quickly they learn the curriculum. A typical required time-in-rank is 1 to 2 years after receiving the first black belt. 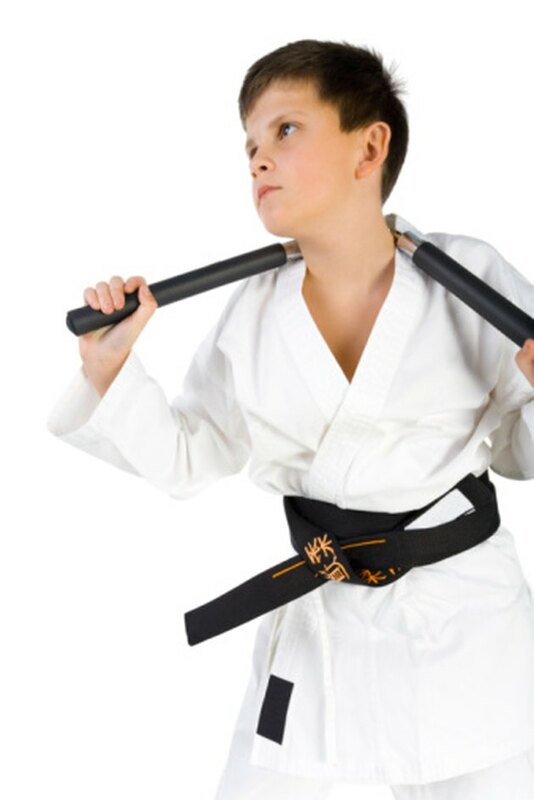 Many organizations set age limits for black-belt rank and higher. Ages 16 and 18 are two common cutoff points for second-degree black belt. As a martial arts student strives for ranks above first black belt, organizations often move away from physical requirements and towards educational requirements as a means of demonstrating mastery of the style. As with other requirements for second degree, the specifics will vary from organization to organization, but a second-degree candidate can typically expect to complete a thesis on some aspect of his training. The further you climb the mountain of martial arts, the more your rank will be based on your contribution to your school, you organization and the art as a whole. Second-degree black belt candidates are judged primarily on personal growth, but it is not unusual for schools to require some kind of contribution from a candidate to qualify for second degree. Assuming teaching duties at the school is the most common example of this kind of requirement.